Innovative and practical design for field and/or studio. 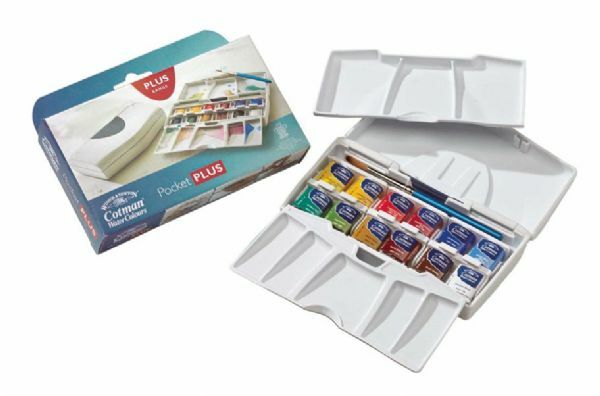 * Includes 12 Cotman watercolor cakes Cotman pocket brush three mixing surfaces and multiple wells. * Convenient pocket size with integral soft thumb ring. * Features a clip-on palette plus a removable internal palette for versatility and easy cleaning. * Colors include: Chinese White Burnt Umber Burnt Sienna Yellow Ochre Viridian Hue Sap Green Cobalt Blue Hue Ultramarine Alizarin Crimson Hue Cadmium Red Pale Hue Cadmium Yellow Hue and Cadmium Yellow Pale Hue. * Also include Cotman pocket brush and three mixing surfaces that include a clip on palette and removable internal palette. 5.25" x 4" x 1.3"